Australia is a young nation, while its territory is very old. For thousands of years, Aboriginal were its only inhabitants. In order to exploit Australia's wealth, the first European settlers had to face many challenges and to find a way to survive in the pristine nature. They created a society that was first strongly influenced by the British way of life, but is now resolutely turned towards Asia and Oceania. 50 millions of years ago: Australia splits off from the huge continent it was forming with Antarctica. 50 000 BC: The first inhabitants of the Australian territory arrive on foot from New Guinea. These first inhabitants are now referred to as "native Australians" or "Aborigines". 12 000 BC: Tasmania and New Guinea are separated from each other due to an increase in sea level. 2 000 BC: The dingo is introduced in Australia, probably by navigators. 800 BC: The boomerangs are now used for hunting. 150 AC: The Greco-Egyptian geographer Ptolemy supposes the existence of a "Terra Australis Incognita". 9th century: Chinese navigators reach the northern coast of Australia. Around 1290: Marco Polo's diary alludes to a territory located in the south of Java. 1606: Willem Janszoon, a Dutchman that was travelling to Java, drops anchor in the north-western part of the Cape York Peninsula. 1642: Abel Tasman reaches the western coast of Australia. He names it Van Diemen's land. 1688: William Dampier explores the north-western cost of Australia. 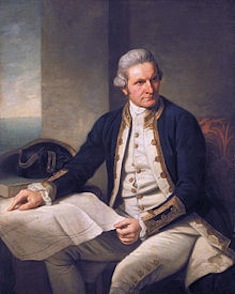 1770: James Cook berths in Botany Bay, and then explores the eastern coast, from the south to the north. He takes possession of this territory in the name of the King of Englans and calls it "New South Wales". 1788: The "first fleet" arrives in Australia, carrying more than 1,000 convincts and seamen. 1790: The "second fleet" reaches Australia. 1793: Australia greets its first voluntary immigrants. 1803: The first Australian newspapers are created. 1801-1803: Matthew Flinders navigates around Australia and proves that this is an island. 1813: Australia acquires its own currency. 1817: The name "Australia" is definitely adopted to replace the former one - New Holland. 1829: Perth is founded by European pioneers. 1830: In Tasmania, Aborigines are confined. 1836-1837: The cities of Melbourne and Adelaide are founded. 1838: Twenty-eight Aborigines are killed by European settlers. This event is commonly known as the Myall Creek massacre. 1851: ... then gold in New South Wales and Victoria. 1854: Gold miners rebel against the colonial authority of the United Kingdom. 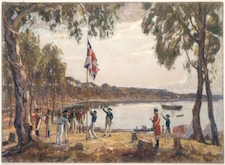 Known as the Eureka Stockade, this rebellion is considered to be the first political act of the new country. 1855: Australia's biggest island changes name and becomes "Tasmania". 1860: Burke and Wills cross Australia from south to north. 1868: Convicts are no more deported. 1883: European settlers discover silver in New South Wales. 1895: Banjo Paterson wriste "Waltzing Matilda", Australia's second anthem. 1901: The 6 Australian colonies gather into the "Commonwealth of Australia". Its Parliament is located in Melbourne. 1914-1918: 300 000 Australian soldiers take part in the First World War. 8 000 of them are killed during the Gallipoli Campaign. 1923: Vegemite, Australia's famous food paste, is created by Cyril Callister. 1927: The Australian Parliament moves to Canberra. 1928: The Royal Flying Doctor Service is created in Queensland. 1930: Due to the Great Depression, unemployment rises to 25% of the active population. 1932: Australia's most famous bridge, the Harbour Bridge, is opened. 1939: Australia enters the war against Germany. 1941: Australia declares war on Japan. 1942: 15 000 Australians are imprisoned following the fall of Singapore. The Japanese airforce bombs Darwin. 1945: Australia has a population of 7 million inhabitants. 1950: 150 000 people immigrate to Australia. 1956: Melbourne hosts the Olympic Games. 1959: Jorn Utzon, a Danish architect, is chosen to design the Sydney Opera House. 1965: Australia sends troops to Vietnam. 1967: Aborigines gain the right to vote and are finally recognized as Australian citizens. 1973: The Sydney Opera House is inaugurated. 1974: Darwin is devastated by Cyclone Tracy. 1975: Papu New Guinea gains its independance. 1985: Uluru and Kata-Tjuta are handed back to the Aborigines. 1988: Australia celebrates its bicentenary. 1990: Australia has a population of 17 million inhabitants. 2000: Sydney hosts the Olympic Games. 2001: The Commonwealth of Australia celebrates its centenary. 2003: The Australian government supports the American military intervention in Irak. 2004: John Howard (Liberal Pary) begins his fourth mandate as Australia's Prime Minister. 2005: A series of race riots take place in Sydney. 2007: Kevin Rudd (Labor Party) wins the parliamentary election. 2008: Rudd apologizes to the "Stolen Generations". 2010: Julia Gillard (Labor Party) becomes the first woman Prime Minister of Australia. 2011: Cyclone Yasi causes severe damage in Queensland. 2013: Tony Abbott (Liberal Pary) is elected Prime Minister. 2015: Abbott in defeated in a vote for the Liberal leadership. Malcolm Turnbull becomes the 29th Prime Minister of Australia.